Cook macaroni; drain and blanch with cold water. Put in bowl. Add carrots, green pepper, onion and cucumber. Add a little salt and pepper. Mix together mayonnaise, vinegar, sugar and milk. 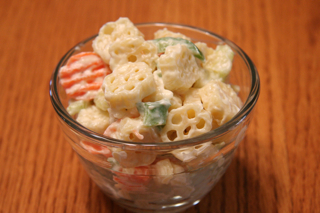 Pour and mix into macaroni mixture and refrigerate overnight for best results. I would suggest shredded carrots for the lazybones people like me.